It is a stone, neoclassical building, with basement and groundfloor, a tiled roof and a broad staircase in the front. The facade of the projecting, central part, is dominated by six large columns, in front of the main entrance. The plan of the building is actually cross-shaped, and a variety of decorative elements are visible on all sides: decorative bands, corner antae, built-in pillars etc. 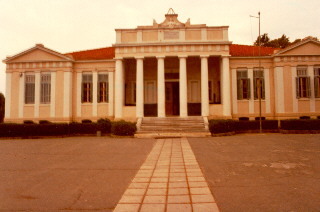 The building was constructed in 1910 by a donation of Venetokles and it occupied part of the large communal piece of land, that also included the Kazouleion and the Astike School. Today it is used as the High School of the City of Rhodes.